It doesn’t matter if I’ve made it myself or if I’ve bought it at the store, I try to never waste a scrap of puff pastry. So much potential in those little buttery off-cuts…pigs in a blanket, palmiers, Michel Richard’s Parmesan Puffs…I could go on, but let’s focus on the Parm Puffs. Take your leftover bits of puff, cut them into willy-nilly shapes and fry them up in a bit of oil till they’re puffed and golden. Then sprinkle them with salt and shower them in good grated parmesan. 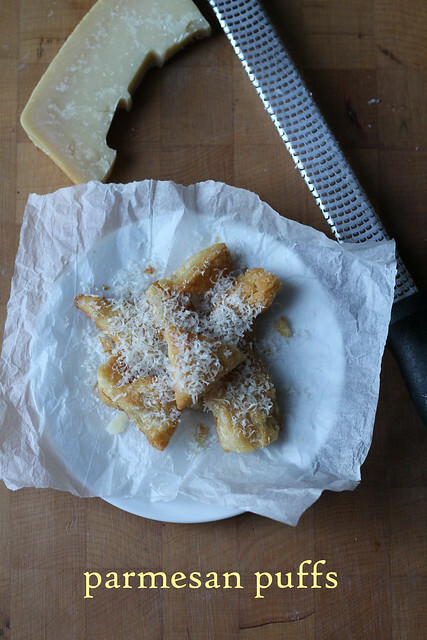 Cheesy, buttery and salty– they are the perfect holiday party nibble. My hostess-with-the-mostess tip of the day: Champagne and fried stuff is a match made in heaven. Yours looks fabulous! And some bubbly is a brilliant match, agreed.